Biometrics is the technical term for body measurements and calculations. It refers to metrics related to human characteristics. Biometricsauthentication (or realistic authentication) is used in computer science as a form of identification and access control. ​Faced with document fraud and identity theft, with new threats such as terrorism or cybercrime, and faced with the understandable changes in international regulations, new technological solutions are gradually being implemented. One of these technologies, biometrics, has quickly established itself as the most pertinent means of identifying and authenticating individuals in a reliable and fast way, through the use of unique biological characteristics. Today, many applications make use of this technology. That which in the past was reserved for sensitive applications such as the security of military sites is now developing rapidly through applications in the public domain. They can be either morphological or biological. These mainly consist of fingerprints, the shape of the hand, of the finger, vein pattern, the eye (iris and retina), and the shape of the face, for morphological analyses. For biological analyses, DNA, blood, saliva or urine may be used by medical teams and police forensics. The most common are voice recognition, signature dynamics (speed of movement of pen, accelerations, pressure exerted, inclination), keystroke dynamics, the way objects are used, gait, the sound of steps, gestures, etc. The different techniques used are the subject of ongoing research and development, and, of course, are being constantly improved. However, the different sorts of measurements do not all have the same level of reliability. Physiological measurements are usually considered to offer the benefit of remaining more stable throughout the life of an individual. For example, they are not as subject to the effects of stress, in contrast to identification by behavioral measurement. When was biometrics first invented? Biometrics addresses a longstanding concern to be able to prove one's identity, irrefutably, by making use of what makes one different. Going as far back as prehistoric times, man already had a feeling that certain characteristics such as the trace of his finger were sufficient to identify him, and he "signed" with his finger. by means of something that you possess. Until now, this was something that was relatively easy to do, whether it was by using the key to one's vehicle, a document, a card, or a badge. by means of something that you know, a name, a secret or a password. by means of what you are, your fingerprint, your hand, your face. The use of biometrics has a number of benefits. The leading one is the level of security and accuracy* that it guarantees. In contrast to passwords, badges, or documents, biometric data cannot be forgotten, exchanged, or stolen, and cannot be forged. These applications are predominantly introduced by national authorities, as the biometric enrollment and management of a population's biomeric data call for a tightly regulated legal and technical framework. Today Automated Biometric Identification Systems (ABIS) can create and store biometric information that matches biometric templates for face, finger, and iris. Discover the work of ​​forensic analysts​ in our video. Live face recognition - the ability to do face identification in a crowd in real-time or post-event - is also gaining interest for homeland security – in cities, airports and at borders. The application which has been most widely deployed to date is the electronic passport (epassport), particularly with the second generation of such documents also known as biometric passports, on which two fingerprints are stored in addition to a passport photo. 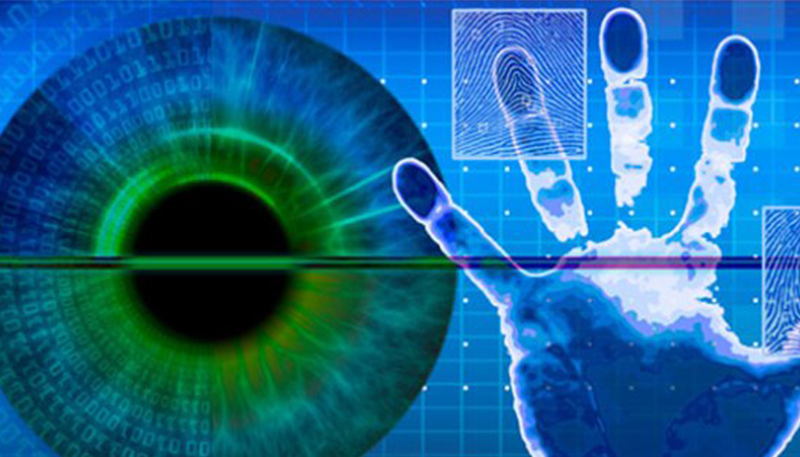 Biometrics provides irrefutable evidence of the link between the document and its holder. ​Identification, if necessary, is done with the biographic data in the chip and printed. Another advantage of this solution is that it speeds up border crossing through the use of scanners, which use the principle of recognition by comparison of the face and/or fingerprints. In addition, many countries have set up biometric infrastructures to control migration flows to and from their territories. Fingerprint scanners and cameras at border posts capture information that help identify travelers entering the country in a more precise and reliable way. In some countries, the same applies in consulates to visa applications and renewals.